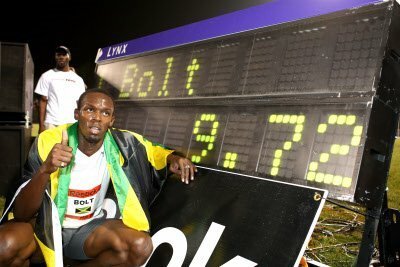 The world has a new “fastest man” – the king is dead (for now), long live the new king, Usain Bolt of Jamaica. Bolt last night beat the defending world champion Tyson Gay, and the absent world record holder Asafa Powell to blitz his way to a new world record over 100m. Powell’s time of 9.74 seconds erased from the books in a time of 9.72 seconds. This performance comes hot on the heels of his 9.76 s time about 2 weeks ago, which served notice that the world of sprinting now had a THIRD big name to look out for. This year’s Beijing Olympic Games 100m race was building up as a showdown between Tyson Gay, the top man of 2007, and Asafa Powell, the seemingly eternally injured Jamaican who held the old world record. Enter a third contender in the 21-year old from Jamaica. His emergence makes that 100m race even more spectacular, with the prospect of three men scorching times faster than 9.80 s in the same race (assuming they all get it right on the day). As for Tyson Gay, he ran 9.85 s to finish in second place, which is not a disaster for him – it’s early in his season, and let’s face it, the Olympic Final is 11 weeks away, and a lot can (and most likely will) change in those 11 weeks. So expect Gay to feature just as strongly – I’d still make him the favourite, if for no other reason than that Bolt is a young man, with a long season ahead of him – the inevitable bumps in the road will be crucial in determining the kind of condition he takes to Beijing. I’ll be very surprised if he is still in this kind of form by mid-August. But for now, celebrations for Jamaica (who could put together a fearsome relay team, the 4 x 100m race will also be a great one), and for a change, 100m sprinting ON the track can dominate the headlines. On another note, yesterday saw Oscar Pistorius’ first race since the CAS ruling two weeks ago that cleared the way for him to qualify for the Beijing Olympic Games on the grounds that the current evidence was insufficient to ban him from competing with a performance advantage. He ran in a 200m race in Holland, in a Paralympic qualifying event, and finished in 22.04 s. Not bad, considering that in his own words, he’s done “hardly any training for the last three or four months” – his best is only 0.5 seconds faster. The temptation is there to say it must be “natural” talent, but it’s the science that I’m most interested in. And while it’s taken 2 weeks, the evidence that he and his lawyers and scientists took to the CAS is finally starting to emerge (though it has still not been published). This week, I have heard a number of reports and read interviews with Prof Hugh Herr, who performed much of that research. Herr was quoted in a few articles, including one interview where he directly addressed the perceived flaws in the IAAF testing and explained the testing process that he believes “clears” Pistorius. That interview provides the best insight into the CAS thinking and that of Pistorius’ lawyers and scientists so far, and so it’s well worth looking at in detail. We’ll look at that interview in a series of posts starting in the week. As was suggested two weeks ago, it will be relatively easy to counter-challenge Pistorius’ research on scientific grounds, finding flaws that are, in some cases, even more significant than those he found with the IAAF testing. I don’t say that with any intention of sounding condescending, but must make the point that the very nature of science is that no study is ever perfect, and all can be questioned, either for the methods used or interpretations drawn. So just as Pistorius and his scientists had their day with the IAAF research, so too, science will have its day with his. The flaw in the whole appeal process, of course, is that the decision has been made without Pistorius’ science ever being exposed to that peer-review process. As a result, there was little opportunity for a counter-challenge to the science done in Houston, despite the fact that it is far from an open-and-shut case of scientific proof. So, in the coming weeks, I’ll take a look at each of the key research areas that the IAAF first looked at, and then how Pistorius managed to challenge their findings, according to Herr’s interview. I really do hope that at some stage, the science is published, and then the science can be taken to a whole new level of scrutiny. But until then, the interview offers a great deal of insight and is well worth discussing. At the very least, it should stimulate some discussion, though my belief is that it exposes some of the errant thinking that was presented to the CAS without any chance of defence by the IAAF (though they are to blame for that particular problem, for the science presented by Pistorius is not difficult to counter-challenge). The first one we’ll look at is the whole energy-use question – does Pistorius use less energy than able-bodied runners? Recall that the IAAF measured oxygen use during a 400m race and concluded that he used less energy. Herr and the other Pistorius scientists challenged that on some technical/semantic grounds. The irony is that in so doing, they actually expose perhaps the most convincing evidence of a physiological advantage to date. But that’s an appetizer for later…Join us for that next week. In the meantime, someof the better reports I’ve read on the CAS verdict can be found here and here. The second article is particularly interesting – it’s written by a direct of a centre for Bioethics who actually looks past the question of advantages and argues it from an ethical perspective. An interesting read. This post is part of the following threads: News/Controversies, Oscar Pistorius – ongoing stories on this site. View the thread timelines for more context on this post.